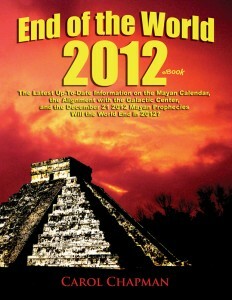 The End of the World 2012 Book gives you a straight, simple explanation of the 2012 Mayan prophecies. It was completed in October 2012 and contains the latest, up-to-date information, including archaeological discoveries released in April and June 2012. Most other books on 2012 are older. This book is written for you! The End of the World 2012 Book is a memoir of director/producer Carol Chapman’s quest to discover the truth. She investigates the end of the world 2012 Mayan prophecies and examines if the Mayan calendar actually ends on December 21, 2012. She includes the same topics covered in her End of the World 2012 Movie and also some background information about the people she interviewed as well as behind the scenes descriptions of making the movie. Carol travels to Yucatan, where she interviews Mayan shamans including Daykeeper Hunbatz Men author of Secrets of Maya Science/Religion. She visits a Mayan Shamanic Equinox Ceremony and asks Shaman Don Valerio for his 2012 predictions. She also talks with Kristine Ellingson, author of Tales from the Yucatan Jungle: Life in a Mayan Village to discover if the rural Maya are preparing for the end of the world. Kristine is an American married to a Maya man and has been living in a Mayan village for 20 years. While in Yucatan, Carol also visits the famous feathered serpent equinox event on the Pyramid of Kukulkan at Chichen Itza. To get to the truth, she interviews Dr. Robert K. Sitler, an expert on the Maya, Director of the Latin American Studies Program at Stetson University and author of The Living Maya: Ancient Wisdom in the Era of 2012. She describes the latest 13 Baktun Mayan glyphs, which were deciphered and released in June 2012 by world-renown epigrapher Dr. David Stuart, author of The Order of Days: Unlocking the Secrets of the Ancient Maya. Carol delves deeply into the 2012 phenomenon by talking with experts on the 2012 predictions in Edgar Cayce’s psychic readings. Carol also asks a Vedic Astrologer about a 2012 awakening. Do you fear that the alignment of the earth and sun with the Galactic Center on the winter solstice will create a doomsday event? Carol attends a gathering of amateur astronomers where she discovers the reality about the Galactic Center alignment. Can the world really end? With Carol, you will explore previous end of the world scenarios caused by volcanoes, ice ages, floods, and a meteor that exploded in the Yucatan 65 million years ago leading to the extinction of the dinosaurs. She also investigates the possibility of an upcoming magnetic pole shift and an asteroid collision in 2029. You will enjoy reading as Carol gets to the surprising truth. End your confusion! 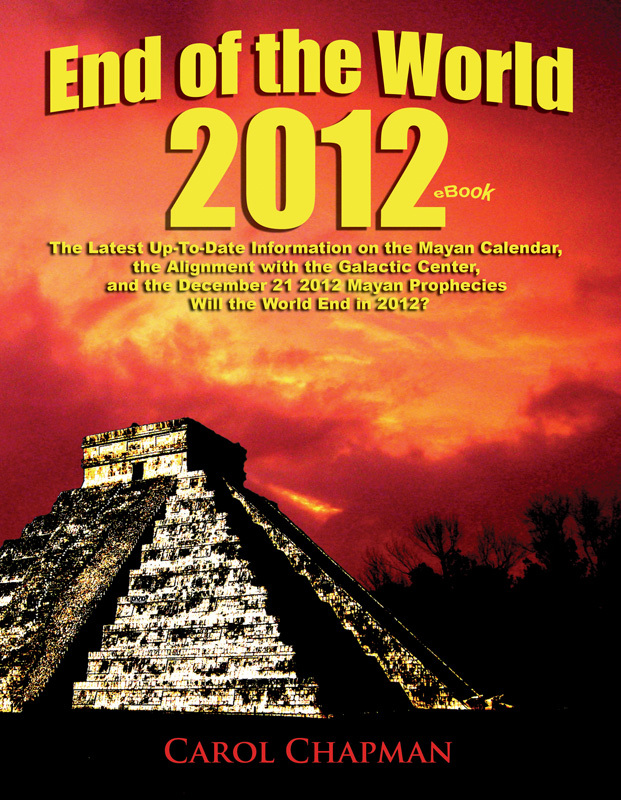 Get your answers in the End of the World 2012 Book! The End of the World 2012 Book and EBook are illustrated with 30 images including photographs of Mayan ruins in Tulum, Coba, Uxmal, Palenque, and the Chichen Itza Serpent Equinox Event. Illustrations also include images of a Mayan shamanic ceremony and the Galactic Center. In the Canada from Amazon.ca as a Kindle.